Driving into Cullinan you see a Caltex petrol station on your right and you cross a railway line. KEEP LEFT to drive into Hotel Street and continue about 600m until you reach a 3-way stop with the Post Office on your left. 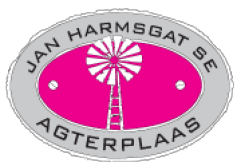 CROSS the railway line and continue until you see JANHARMSGAT SE AGTERPLAAS on your left at number 88 Oak Avenue. FOLLOW the N4 Witbank Freeway eastwards, away from Pretoria. PASS the Boschkop/Donkerhoek turn-off and take the next turn-off (Exit 27) for Rayton/Cullinan /Babsfontein. PASS the Premier Golf Course in Cullinan on your right. CONTINUE until you get to a 4-way stop with a Wimpy on the opposite side. TURN RIGHT into Oak Avenue. At the next stop street sign you will see the Post Office on the left hand side. CONTINUE past the Post Office as well as a Nedbank on your left, a 4-way stop and Premier dairy on your right.